Mrs. Maxine Jones-Ebron was born on March 26, 1945 to Ms. Birdie Lee Jones in Baltimore, Maryland and departed this life on November 2, 2018 in New Port Rickey, Florida. Maxine received her formal education through the New York City Public School system where she excelled at her studies. She has joined her beloved soul mate, Richard Ebron whom she married in 1998. Sister Jones-Ebron accepted Jesus Christ as her Savior and was a member of the Abyssinian Baptist Church in New York City for many years. Upon relocating to New Jersey, she joined The Union Baptist Church of Elizabeth. 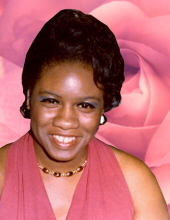 She was a member of the Noon Bible Study, the Progressive Women and Mothers Fellowship where she served as Treasurer. Sister Ebron was a faithful member who truly loved the Lord, her Pastor, First Lady and the Church family. She was employed at American Telegraph and Telephone Telecommunication Company where she served dutifully for thirty-four years before retiring in 2002. In her leisure time, Maxine enjoyed going on outings, watching movies, visiting her sons in Florida, testifying about the goodness of The Lord and helping others. The things many loved about Maxine were her smile, so distinctly hers, her zest for life, her passionate love for others and her desire to give in any way she could. Her family was the light of her life and she was truly blessed. She was also a fighter who would stand up for what she believed. Her untamed spirit brightened our lives and we will forever carry her in our hearts. Richard predeceased Maxine in June 2008. Left to celebrate their lives and mourn their loss are their sons: Tchaka Ebron and Demetrius Jones along with other family members. Our cherished Richard and Maxine are now together forever and they will always be in our hearts. To send flowers or a remembrance gift to the family of Maxine Jones-Ebron, please visit our Tribute Store. "Email Address" would like to share the life celebration of Maxine Jones-Ebron. Click on the "link" to go to share a favorite memory or leave a condolence message for the family.